Not only is this roasted turkey recipe fool-proof and easy to make, it will exceed expectations as the centerpiece of your Thanksgiving feast! Why in the world do people stress so much over their Thanksgiving Turkey? Ok, I guess it IS the centerpiece of your Thanksgiving meal. And that usually means you have a table full of people not to disappoint. Ok, I get it. It’s a big deal. My hope is to squash any fears or insecurities you might have about cooking a perfect, beautiful Thanksgiving Turkey. This method is completely fuss-free and EASY. There’s no brining or basting the turkey, no cooking it upside down, or anything weird. You don’t even need an expensive roasting pan. 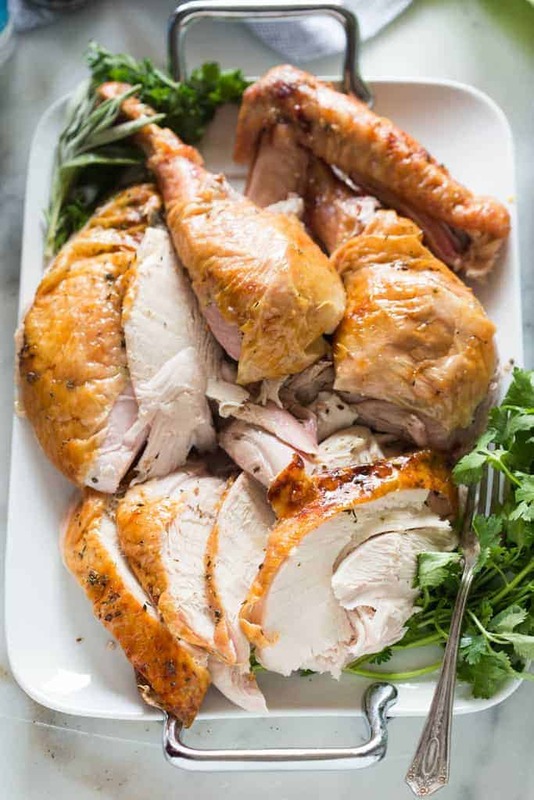 I’m convinced that this recipe is not only the simplest way to cook a Thanksgiving turkey, it also yields a gorgeous, super juicy, perfectly cooked turkey. The real KEY to baking a perfect Thanksgiving Turkey is not to overcook it–that’s what dries out the meat, and you want to carve into a juicy, moist turkey on Thanksgiving! So, just plan ahead to get the timing right. First things first: Buy about 1.5 pounds of turkey per person. (So if you’re feeding 6 people, buy at least a 10 lb. turkey). That way you’ll have leftovers. Make sure and allow plenty of time for your turkey to thaw! A good rule of thumb is to allow one day in the fridge for ever 5 pounds of turkey. I always give myself one extra day, just to be safe. Set the turkey on a cookie sheet or pan, to catch any liquid the turkey may drip as it defrosts in the fridge. If you wash your turkey in your sink you will just contaminate your sink. Remove the turkey from it’s packaging, dry it off with some paper towels, and then prepare it for the oven. Any bacteria on the turkey will be killed in the hot oven while it bakes. If you buy a high-quality turkey from the store (like Butterball or Norbest), then brining the turkey is an unnecessary step. You can do it if you want, but you can still achieve a deliciously moist turkey without brining it. However, if the turkey is wild, you should brine it the night before to make sure it will be moist and flavorful. Basting is really unnecessary to produce a beautiful golden brown turkey. It also requires you to constantly open the oven, which causes the oven to loose heat and the turkey to take longer to cook–which could lead to a dry turkey. 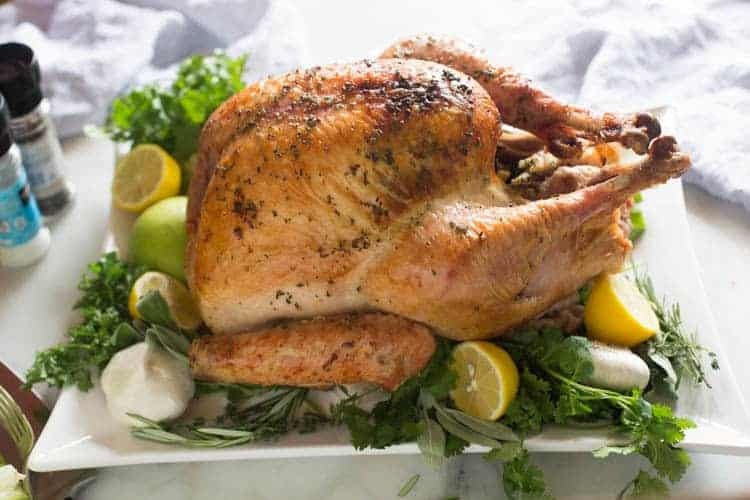 By smearing an herb butter mixture over the outer and inner skin of the turkey you will ensure the skin will brown beautifully, and taste amazing. Don’t cook stuffing inside the turkey. 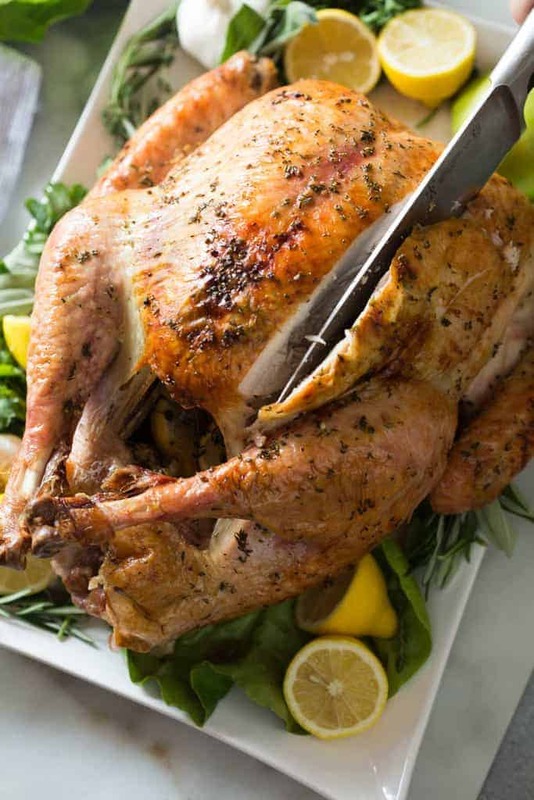 If you try to put stuffing/dressing inside the cavity of the bird, the turkey will be overcooked by the time the stuffing reaches a temperature that’s safe to eat. Instead, cook your stuffing in a casserole dish. Then you can fill the cavity of the turkey with things that will give it flavor (and add flavor to the drippings/stock): salt and pepper and any mixture of onion, apple, carrots, celery, or citrus. Do test the turkey with a thermometer. The only way to really tell if the turkey is cooked (165 degrees F), is by using a thermometer (I love this one). Test the turkey right from the oven—if it reaches 160 degrees F, I take it out and tent it with foil. It will continue to cook inside the foil tent to make up that extra 5 degrees. Do let the turkey rest. After removing the turkey from the oven, let it rest for at least 15 minutes, or up to 40 minutes (that gives you some extra time if you need to bake or warm anything else in the oven). If you’re using the drippings for gravy, remove the turkey from its pan, to a cutting board and tent it with foil while it rests there. If you’re not using the drippings, then just leave the turkey in the pan and tent with foil. You don’t need an expensive roasting pan. If you have a big metal roasting pan, great! If you don’t, no worries. Just use a casserole dish big enough to fit the bird, or buy a $1 disposable foil roasting pan from Walmart (then you can throw it away after). Place a bunch of chopped veggies on the bottom of your pan. The veggies will act like the wire rack in a regular roasting pan by elevating the turkey slightly. Place the turkey right on top of the chopped veggies. Do save the turkey drippings. First, remove the thawed turkey from it’s packaging. Remove the neck (usually found in the large cavity of the bird) and the bag of giblets (sometimes found in the smaller neck cavity of the bird). Discard them, or save them for gravy. Pat the turkey dry with paper towels. Next, season the cavity of the turkey with salt and pepper. Stuff it with the quartered lemon, onion, apple and herbs. Tuck the wings of the turkey underneath the turkey and set the turkey on a roasting rack inside a roasting pan (or on top of a bed of chopped veggies —carrots, onion and celery work well—in a disposable roasting pan). Tucking the wings prevents them from burning, and helps the turkey sit flatter. 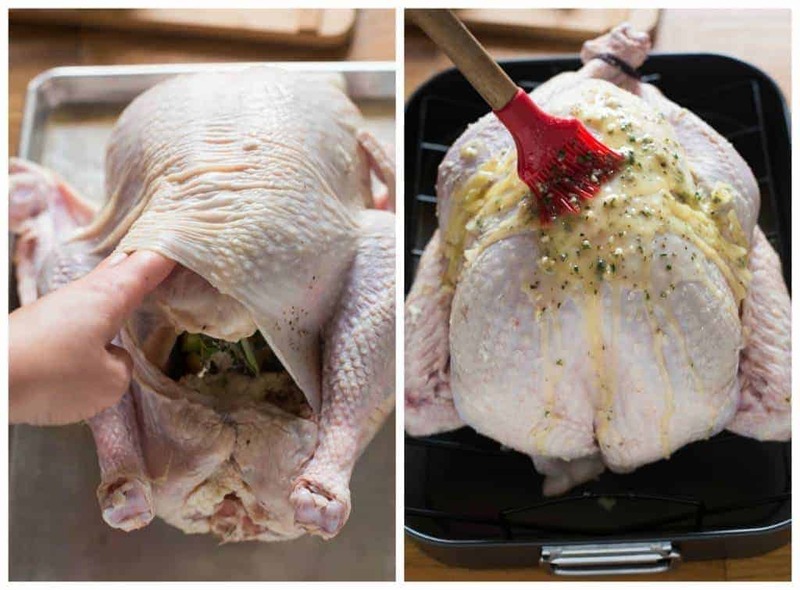 Use your fingers to loosen and lift the skin above the breasts (on the top of the turkey) and smooth a few tablespoons of the herb butter underneath. Use some twine to tie the turkey legs together. Then slather the outside turkey in the rest of the herb butter. That’s it! You are ready to let your oven do the rest of the work! You will want to check the turkey about half way through cooking. Use your oven light to see if the skin is golden, and then place a large piece of tinfoil over the breast meat of the turkey to help keep it from overcooking. 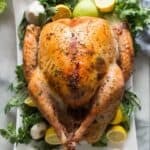 Whether this is your first time cooking a turkey, or you just decided to give this method I try, I would love to hear from you! Rate the recipe and comment below with your experience. 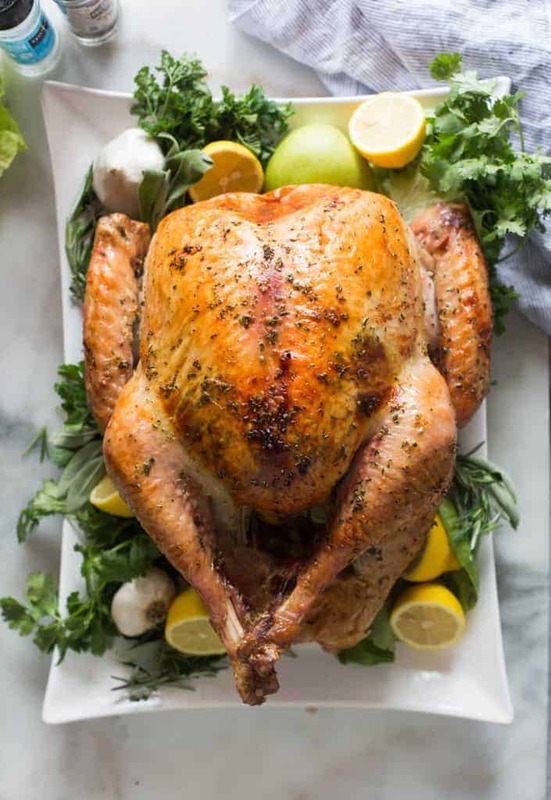 Foolproof Thanksgiving Turkey recipe that packs all of the flavor and juiciness you expect from the perfect roasted turkey, with none of the stress! 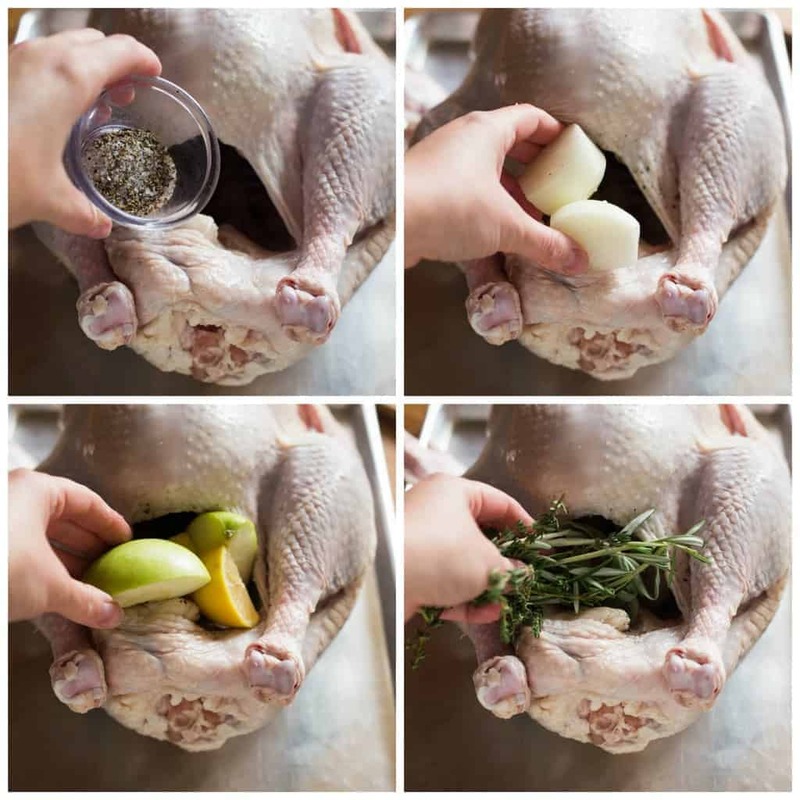 Step by step for how to cook the perfect turkey. If the turkey is frozen: Thaw in the fridge, 24 hours for every 5 pounds of Turkey. I like to give myself 1 extra day, just to be safe. Adjust your oven rack so the turkey will sit in the center of the oven. Preheat oven to 325 degrees F.
Roast at 325 degrees F for about 13-15 minutes per pound, or until internal temperature (inserted on middle of thigh and breast) reaches about 165 degrees. ***Check the turkey about halfway through cooking, and once the skin gets golden brown, cover the top of the turkey with tinfoil, to protect the breast meat from overcooking. Alternately, you could start cooking the turkey with it tented in foil, then during the last hour or so of cooking you can take the foil off to let the turkey brown. *If you don't have a roasting pan, use a disposable foil roasting pan. Place a bed of chopped veggies —carrots, onion and celery work well— in the bottom of the pan, and set the turkey on top of them. RATE and COMMENT below–I would love to hear your experience. I’ll be honest I never had to prepare a turkey or be responsible for a full Thanksgiving dinner until much later in life….. Sadly when it came to be my responsibility my mom had already passed away and you don’t always realize how much you should have paid attention to your mom’s cooking until after you no longer have the opportunity… so I was scouring the internet for how to fix a turkey and I came across this recipe…. and I fixed it the first time at Thanksgiving this year and then again at Christmas…let me tell y’all I was totally turkey ignorant…. 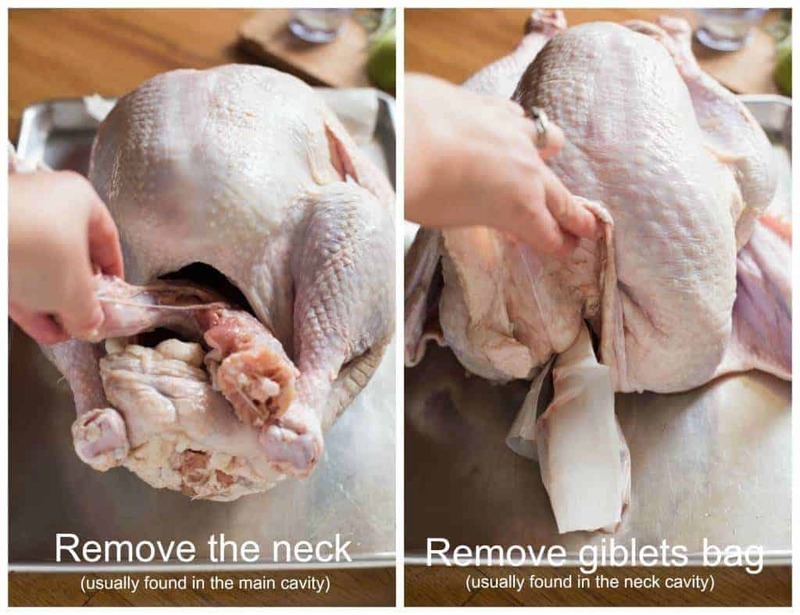 If it wasn’t for this recipe I would have cooked giblet bag inside the neck compartment because I had no idea it was there LOL and for some reason I thought it was in the cavity of the bird….yup it was Tuekey 101 at my house…. anyway…. My turkey came out perfect both times the second time was a little tastier because I had a better idea of how long to cook it and I watched it with a thermometer better than I did the first time but it was so moist that even when I warmed it up the next day in the microwave it was still juicy and the flavor is perfect…I got excellent feedback about my bird… So thank you from a lady in Memphis who now officially knows how to cook a turkey… Happy New Year Lauren to you and your family and thank you from the bottom of my heart! Is it necessary to put veggies under the turkey if you’re using an aluminum pan? If so, why? Thank you!! The veggies act as a “rack” to lift the turkey up so it browns more evenly. You don’t have to use them. After a long brutal search of the best recipe for cooking the holiday turkey.,,,.i chose this one. I read MANY of the reviews and was satisfied that this was the ONE! I followed this recipe precisely from beginning to end…. (except for the garlic! I used only 3 cloves as I thought this strange for a turkey). Everything was wonderful until we pulled Butterball Tom out of the oven. The smell of garlic was strong! After letting Tom rest for forty minutes…my youngest son commenced carving. By now the garlic was overpowering all other scents in the room…including the scrumptious fragrances of holiday greens. The garlic overpowered! The turkey was the “strangest” tasing turkey ever cooked in this household!! There was so much turkey leftover because nobody wanted to eat it. I had to use TWO of my largest pans to boil the carcass down for soup. The soup is the meatiest ever….yes. BUT….I have never been so disappointed and embarrassed with the outcome of a turkey.?? What alterations to this recipe do you recommend if my turkey is only 5lbs? You would still cook it the same — 13-15 minutes per pound. Thank u so much for this recipe! Really easy and no fuss. First time I tried roasting a turkey and it came out so good. Thanks for the helpful tip of using an Al roasting rack with a bed of vegetables underneath which is what I did. I have cooked many turkeys over the years, some more successfully than others, my first one was even upside down! But this one was the best by far! No basting is awesome too. I fallowed the recipe but omitted the sage and used lemon thyme. It was just perfect! Thank you kindly! I’m planning on cooking a turkey tomorrow. We grew up using turkey bags. Can i use it with this recipe or should i avoid it? Thank you! Stunningly delicious! I included quartered apples along with the veggies under the turkey and made gravy from the pan juices. BEST GRAVY EVER. Rave reviews from even picky children!